Standing in a hedgerow just outside the quiet village of Rhandirmwyn in Carmarthenshire, this tree is a giant, with a girth of some 8.4 metres. Some have estimated it to be 600-700 years old, while local historians believe it was planted to commemorate the Battle of Bosworth. It is reputed to have been the hiding place of a king; the local pub is known as the Royal Oak, after all. The tree is hollow, and there are a number of YouTube clips of bands and choirs singing inside it. Many years ago it is understood to be a meeting place for local lovers. The farm used it as the shelter for the pig and now the ducks from the current owner roost and hatch in the branches. Wedi pleidleisio ar ôl clywed sgwrs ddiddorol ar radio cymru. Ardderchog …make sure it is preserved. 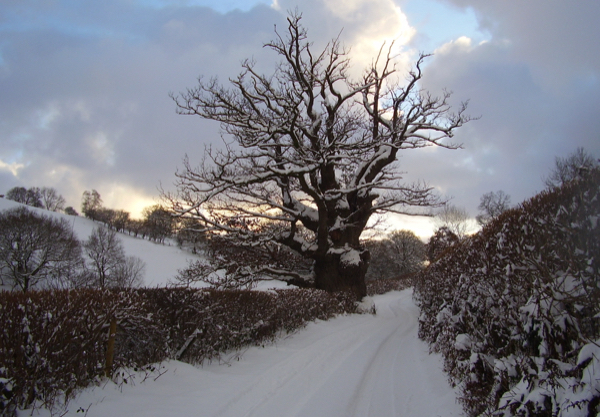 It is wonderful to see pictures of this grand old oak tree – we occupied the neighboring farm, Dinas Bach for 18 years. We would pass this tree every time we visited our local pub, the Royal Oak. There are quite a few stories to tell about this tree.